Vitus Bering gets the credit for being the first European to discover Alaska. Most stories focus on the summer of 1741 when he discovered Alaska. But the journey really started 16 years earlier. Bering was born in Denmark. He had served in the Russian navy since he was 22. He served Russia well and was picked by Peter the Great, the Czar of Russia, to lead an expedition to explore the north Pacific. The Czar was dying but he had this one last grand plan. Before he died on January 28, 1725, he wrote out and signed detailed instructions for Bering, who was to travel with a crew from St. Petersburg with supplies to the Kamchatka Peninsula, some 6,000 miles away. Once there, they were to build several ships to explore the northern Pacific. The Czar was hoping to find out if Russia and America might be connected by land. The crew carrying the supplies began their epic journey before Bering left St. Petersburg. Bering caught up with the crew in mid-March of 1725. It took more than three years to get all the supplies needed across mountains, rivers, and hostile land to the Kamchatka Peninsula. They carried ships' anchors, lumber, heavy tools, and a year or more of food supplies across some of the coldest and roughest land of northern Russia. Where they could, they loaded materials on boats to float the rivers that all eventually emptied into the Arctic Ocean. Along the way, many died. Finally, in July, 1728, they had completed one ship, the St. Gabriel. Bering and his crew sailed north searching for a link between Russia and America. They sailed past an island Bering named Saint Lawrence and continued north. They saw no more sign of land. The weather was bad and it was mid-August. They didn't want to get caught in winter storms. Despite the suggestion of his junior officer Alexei Chirikov, Bering made the decision to head back. 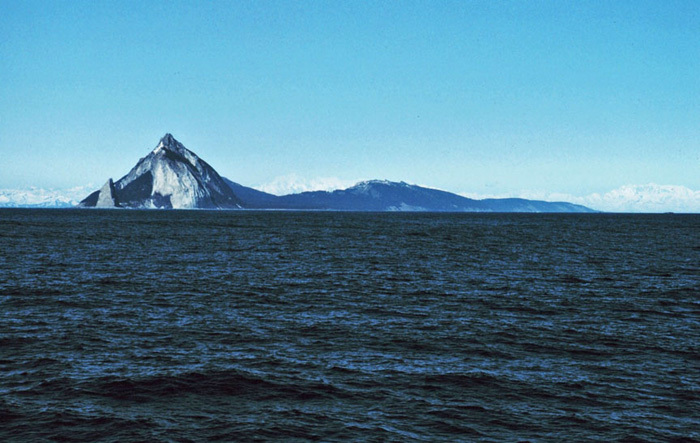 On their return, they saw another island they named Saint Diomede. In their hurry they sailed on instead of looking around. If they had, they might have seen Alaska. They had charted new shores and explored thousands of miles, but they just missed America. Bering would not accept defeat. He traveled to St. Petersburg to give his report. He then proposed that he be sent back to continue exploration. He wanted to do more than just find America. 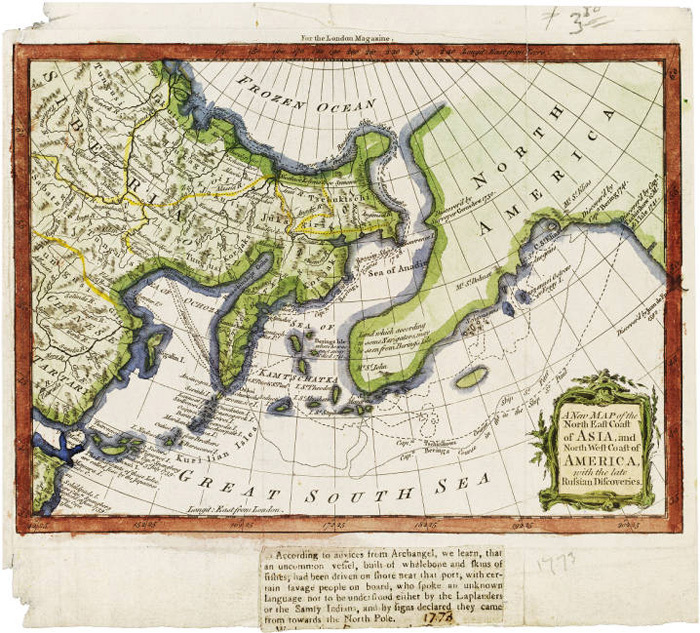 He wanted to chart the entire northwest coast and explore routes to Japan. By 1732, he got his orders. Nine years later, with much of the other exploration accomplished and two new ships built, he finally was back at sea. 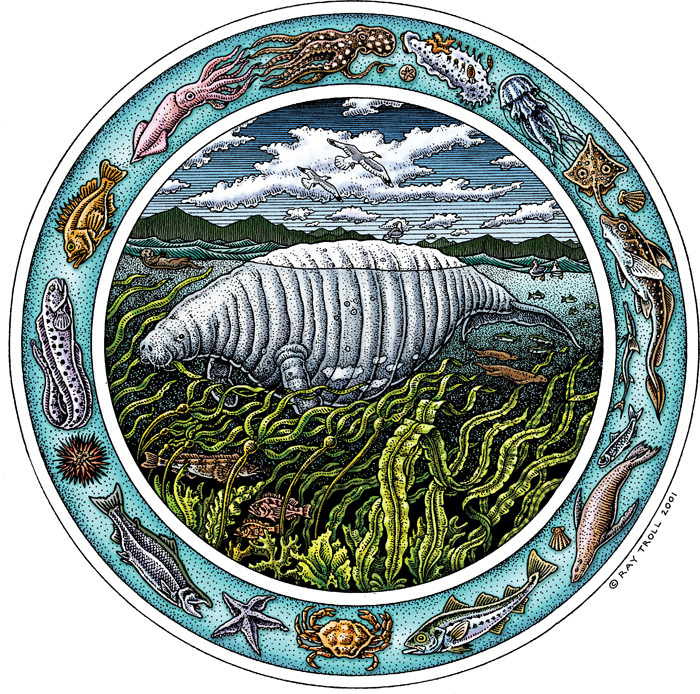 On June 4, 1741, Bering set sail in the St. Peter. Alexei Chirikov was in a second ship, the St. Paul. The two ships got separated during a storm and never found each other. Chirikov spotted land early in July and sent a crew to explore. They didn't respond when signaled, and a rescue boat was sent. Neither party was ever seen again. Chirikov hated losing any crew. He was very concerned because he had also lost the boats needed to get ashore for fresh water and food. He had no choice but to head back to Kamchatka as quickly as possible. The return journey was deadly. Many died and many more were so sick with scurvy that they could not walk when the ship finally landed in Russia. Two days after Chirikov had seen the snowy mountains, Berings crew spotted what is now called Mount St. Elias. Bering was tired. The 16 years of struggle had worn him down. He had found America. He had reached his goal and he just wanted to get back home. First he had to send men to shore for fresh water. The young naturalist on board, Georg Wilhelm Steller, expected to go ashore with the men to explore. Bering refused at first, but Steller convinced the weary Bering to let him go. Steller accomplished much in the short 10 hours he had on land. He managed to collect, list, or describe 143 different species of plants plus many birds, fish and animals. Steller's jay and Steller's Sea Cow are just two of many species bearing Steller's name. The ship turned around and headed back to Russia. But the crew wouldn't listen to Steller, who told them they could avoid scurvy by eating fresh foods. Many of the crew didn't like Steller much. He could be rude and acted a bit like a know-it-all. So by early November, only 10 of the 78 crew were fit enough to work. Winter storms were beating the ship. Bering was very ill, but he wanted to sail on. His senior officers disagreed and decided to try to land. The attempt failed, as a storm blew the ship onto the shore of what is now called Bering Island. Now shipwrecked, those who could walk carried the sick on shore. They managed to create some shelter by digging into the sand and gathering driftwood. For many, the effort of coming on shore was too much and they died. On December 8, about one month after the wreck, Bering died. Steller had hoped to save him by feeding him fresh greens he gathered on the island. Some believe that Bering did not die of scurvy. Steller did manage to save many of the remaining crew who finally were convinced that Steller was right about the fresh foods. 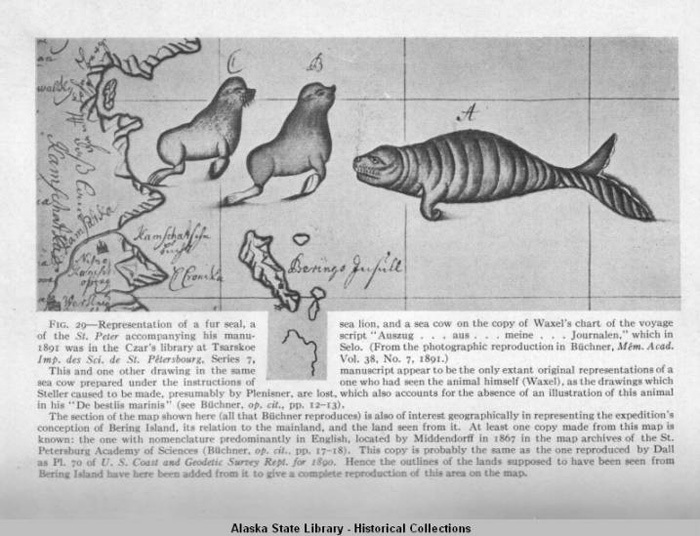 Steller and others who were strong enough managed to kill the abundant sea otters, seals, birds, sea cows and even whales for fresh meat. This with the fresh greens helped the surviving crew regain their strength. But 32 of the 78 who sailed with Bering on the St. Peter died. As the survivors regained their health, the crew, led by the second lieutenant Sven Waxel, decided to build a boat from the wrecked St. Peter. They would sail this smaller boat back to Russia. By August, 1742, they set sail. The 40-foot boat was not big enough for anyone to lie down. The winds were so strong that they had to lower the sail and row much of the way. But within two weeks, they landed in Russia. Their prize for their suffering was claiming Alaska for Russia. And the rich, dense pelts from the fur seals and sea otters that they brought with them proved that Alaska was worth finding. The Explorers of Alaska by John David Ragan, Chelsea House, 1992. The Haunted Journey by Robert Murphy, Doubleday & Company, 1961.